It’s easy for you to have the lawn that you’ve always wanted – when Green Planet takes care of your property. We offer a 7 application program that's designed to put our technicians on your lawn every 30-45 days throughout the season. This allows our state-certified technicians to evaluate your lawn during every visit and provide the best products and customer care in the industry. 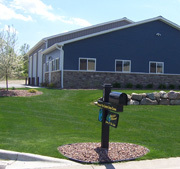 We take personal responsibility for your lawn’s progress, and we guarantee your satisfaction. If you’re not satisfied we’re not satisfied; simply call us and we’ll make it right. (Mid March-1st of April) - Complete balanced granular fertilizer with pre-emergent crabgrass control. (1st of April through end of May) - Balanced fertilizer and broad leaf weed control. (June to July) - Treatment of balanced granular fertilizer and spot treatment of broad leaf weeds. (Mid July-Late August) - Balanced granular fertilizer and broad leaf weed control for summer weeds. (1st of September to Early October) - Promotes fall green color and extra vigor along with spot treatment of weeds. (1st of October to mid November) - Special feeding to promote root growth and encourage a thicker, lawn in the spring. (Mid November) - Helps the turf to store nutrients in the winter to encourage early spring green up.